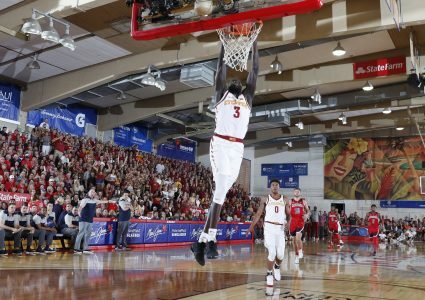 AMES – Cameron Lard and Zoran Talley are not tasked with reinventing the wheel. 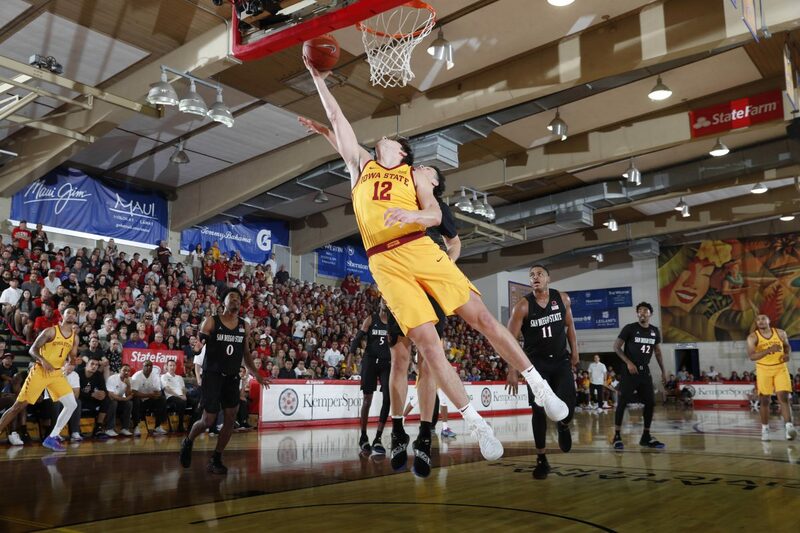 The Cyclones’ star sophomore center and fifth-year senior wing returned from their month-long suspension on Monday in Iowa State’s 81-59 win over North Dakota State. 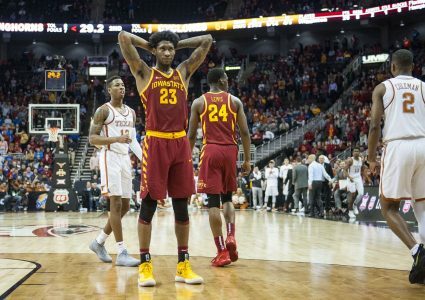 Neither of them made a huge mark on the victory, but how can you expect them to after the way Steve Prohm’s shortened eight-man rotation played during the month of November? Few people, if anybody, expected Iowa State to be 7-1 entering a Thursday night tilt with the rival Iowa Hawkeyes. This team has established an identity through eight games and there is no reason to put it in jeopardy regardless of how many points Lard scored down-low last season or how many minutes Talley has played in his college career. Lard, the 6-foot-9 preseason honorable mention All-Big 12 selection, quickly announced his return to the court when he blocked a pair of Bison shots on one possession then capped it with an assist for a 3-pointer on the other end. On the night, he scored two points on 1-of-3 shooting, blocked those two shots, grabbed one rebound and dished the one assist. It is going to take time for Lard to return to the form we grew accustomed to last season. He solidified himself as one of the best young big men in the country and was arguably the most dominant low-post scorer in the league at times. Unfortunately for him, he is tasked with battling for minutes in a way he never had to face last season. Nebraska transfer Michael Jacobson scored 15 points on 5-of-9 shooting and grabbed 10 rebounds against the Bison, continuing his better than solid start to the season. Jacobson’s start to the year somewhat personifies the way this entire Iowa State team has played so far. Nobody outside of the program expected the Waukee native to be this good this fast for the Cyclones. Sure, he was a productive player while playing a boatload of minutes for the Huskers in his first two seasons, but he has played like an All-Big 12 type guy through eight games. He is playing in a way that makes it really hard to justify taking him off the court, let alone out of the starting lineup. This Iowa State team plays a really fun brand of basketball. When is the last time we saw a Cyclone squad consistently get off to quick starts? This one does. They were up 20-8 on Monday seemingly before you could register the game had started. 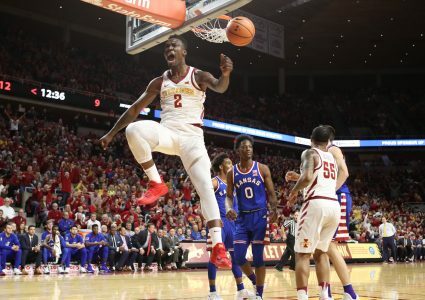 They play with tempo and have guys who are capable of putting the ball in the hole, like Marial Shayok (20 points on 9-of-15 shooting) and Talen Horton-Tucker (12 points on 5-of-16 shooting). The Cyclones no longer will have to rely on big performances from Lard or sophomore guard Lindell Wigginton, once he returns from a foot injury later this month like they constantly did last season. Both players have the potential to make Iowa State better this season. We will find out more about how soon they can do it when the team rolls into Carver-Hawkeye Arena on Thursday to face an Iowa team coming off back-to-back Big 10 losses after they were blown out at Michigan State on Monday. We are going to be forced into having a similar conversation once Solomon Young and Lindell Wigginton return from their injuries. It is a good problem to have, especially after the talent devoid roster Prohm had to work with last season. How badly each of these guys wants to play, will be exhibited by how quickly they buy into the Cyclones’ winning formula.